Adelaide’s dining scene has grown into its own over the years, merging from what was considered to be a try hard copy of the East Coast to a thriving dining culture with its own identity. Local chefs and restauranteurs have delved into the heart of Adelaide and created new restaurants and cafes that really portray the city. Adelaide’s dining scene is multicultural, with cuisines from all over the world that have been fused with new Australian ideas. Today, Adelaide truly is one of the great food cities of Australia. If you’re a foodie, a visit to the city is a must. 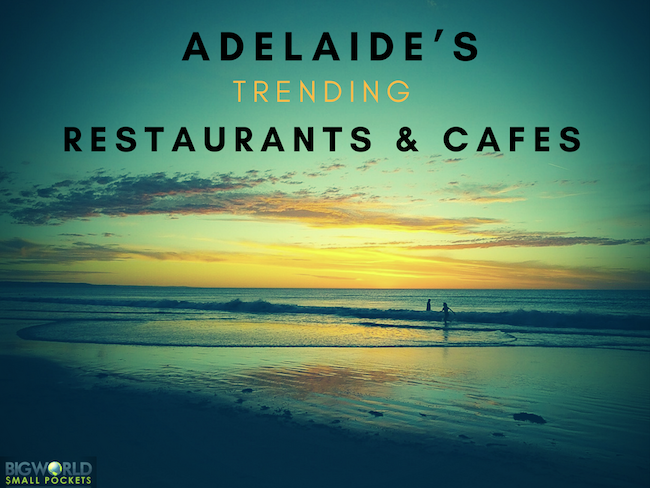 You’ll be sure to find great Adelaide accommodation near these trending restaurants and cafes. Orana is almost the epitome of the uniqueness of the Adelaide dining scene. Chef Jock Zonfrillo envisaged a restaurant that takes local Australian ingredients to create a fine dining experience that merges with the heart of Australia. Ingredients are often Indigenous in nature, with things such as kangaroo, marron and macadamia catching the eye. The menu is creative and inspiring, served as a set tasting menu with dishes such as Octopus, dry aged beef, finger lime and warrigal greens; or Kangaroo, avocado, lilly pilly, kutjera and sandalwood nut. It may sound intriguing to some, or off putting to others, but Orana has grown to become one of the most highly regarded restaurants in Adelaide, and any foodie is sure to be impressed. The Peel Street district has become one of Adelaide’s most popular dining and nightlife precincts, where people venture for after work drinks or an evening meal. Peel St is a trendy place that takes its name from the very street it is on, and you will almost always find a crowd here. The interior of this popular spot is rustic and almost industrial, with big blackboards displaying the day’s specials. This place is all about share plates, so it is the place to go with friends. The menu is exciting and many dishes are Moroccan and Middle Eastern inspired. There is also a good wine and cocktail list to choose from. If you suddenly wake up one morning craving a French style breakfast, Hey Jupiter has you covered. This little French style café is charming with bistro seating out the front and greenery surrounding the entry. Enjoy crusty French baguettes with your choice of eggs or heritage smoked bacon; or perhaps indulge in their Champagne breakfast for two. Sneak in a breakfast cocktail or wait until lunch and enjoy some roasted Berkshire pork belly with cumin spiced slaw and parsley. Few Thai restaurants have had more buzz lately in Adelaide than Social Street S2, located on Hutt Street. This little eatery is all about Thai street food and the fun, social environment that goes with it. The menu here consists of delightfully cooked and presented Thai street food cuisine that is aptly affordable, with dishes from the classic Tom Yum or Pad Thai to Duck Salad or Phat Krapow Moo Sab, served to your desired level of spiciness, ranging from mild to “freakin hot”. This new restaurant on Rundle Street has fast gained a name for itself for its exquisite Iberian inspired cuisine. Their menu is share plate focused, with dishes that take on the unique ingredients that epitomise the cuisines from the Iberian Peninsula. That being said, these quintessential ingredients only make up the base of the dishes, while the main ingredients that make up the body of the dishes are all sourced locally. Iberia also has a good wine and cocktail list, making it a good choice for dinner. Being that Adelaide is surrounded by some of Australia’s best wine regions, it is no wonder that wine bars are popping up all over the city. One good choice is Apothecary 1878, situated in a historic building in West End. While the wine list makes it easy to draw you in, their restaurant menu is sure to capture you and make you stay for the night. Enjoy tasters such as Jerusalem artichoke with sprouted lentils & cumin, and then indulge on pork belly with cabbage, muscatels & parsnip. Alternatively, choose the chef’s tasting menu to enjoy with your partner or group of friends, with wines to match your meal. This new breakfast and brunch place has a relaxed vibe and a light and airy feel, situated in an old industrial building on Richmond Road. Sit below high ceilings on mismatched chairs with tree ferns adding greenery to the space, and dine on pulled pork benedict or colourfully presented ricotta pancakes. With good coffee to match, Karma and Crow is definitely a spot to try for breakfast or a social brunch. For an Italian fine dining experience in Adelaide, it is hard to beat Assaggio Ristorante near Hyde Park. This delightful Italian restaurant has long received rave reviews for its exquisite dishes paired with locally produced wines. Let the chef prepare a selection of favourite dishes for you with their set 5 course meal, with the option to pair with wine, or make your own selection from their extensive menu. If you’re searching for something a little different, consider this authentic Afghan restaurant, located on Henley Beach Road, just west of Adelaide’s CBD. Parwana is a family owned restaurant that serves up delicious, authentic Afghani food, at very affordable prices. It has become so popular with locals that they are busy every night and have had to expand. Sample exotic dishes such as Banjaan Borani – eggplant simmered in fresh tomato sauce, topped with garlic yoghurt and fresh mint; or Morgh Lawang – chicken pieces slow cooked in a yoghurt sauce and infused with a traditional mix of Afghan spices. These are just a few of Adelaide’s best up and coming restaurants and cafes, along with a few old favourites that are still trending in the city’s thriving dining scene. One thing is for certain, if you’re a foodie, you are going to love Adelaide.